It’s one of the most critical, interconnected systems in your business. With so many things that go wrong with IT infrastructure, one of the best ways to protect your people—and your productivity—from glitches and downtime is partnering with ComTec. From Virtual Private Networks, to disaster recovery, to desktop repair and upgrades, our team is ready to help, allowing you to concentrate on what you do best. Our professionals have backgrounds in a broad range of industries, so they understand the unique needs of IT across many types of business. They stay abreast of new technologies and watch for proven processes that could benefit your business. Expert support. Peace of mind. With a ComTec Managed Services Agreement, we can help you avoid staffing gaps and adapt based on situational needs. You get uninterrupted support and access to expert, up-to-speed technicians. We make it our business to know the latest in technology and services on the market, and we bring those high standards to your business, to save you time and money spent seeking new solutions. Get a clear picture of your current network infrastructure. Understand the capabilities and shortcomings of your existing network and what is recommended to improve them. Mobile computing can improve flexibility—and productivity—for your workforce because it securely extends network resources to end users. Your employees can access information the same way they do from your private network, from another facility, or from anywhere across the globe. These pros may work for us. But they answer to you. 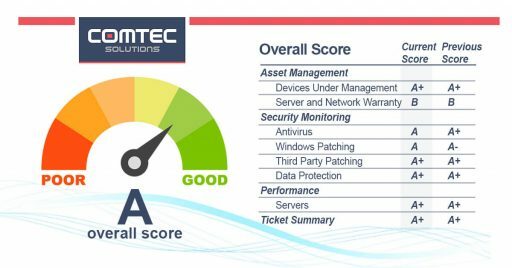 The beauty of ComTec’s Managed IT Services? Seamless simplicity. Sometimes you’re looking for more than a quick fix. Offloading the responsibility of your IT infrastructure to our team can save you time, resources, and headaches. Our team is as accountable to you as if they were on staff—with none of the added costs or responsibilities to weigh you down. You get 24/7 support, proven, quality products, efficient use of your budget, and highly reliable IT. Our Managed IT Services Agreements may be just what you need to get IT off your mind, so you can focus on what you do best. On top of typical IT support, we offer cloud server hosting, cloud backup, and disaster recovery services. Enjoy quicker issue resolution with round-the-clock network monitoring. Our 24/7 monitoring will dramatically shorten the time from problem to resolution, because our technicians always know the health of your network. IT failures can be costly in so many ways. Combining preventive maintenance with remote monitoring lets us minimize failures and their impact on your business. Fully Managed IT Service provides all-inclusive support. Proactive IT Service covers system maintenance and monitoring. Supplemental IT Service provides essential repairs and fixes as needed. We can even craft a custom service level just for you. When you partner with ComTec for IT, you have focused, expert staff that’s attentive, strategic, and proactive. We anticipate your needs and work within your budget and timeline.